March 14 is Pi Day. On March 14, 1988, a physicist, Larry Shaw, organized the first Pi Day at the Exploratorium in San Francisco, California. They continue to hold Pi Day celebrations today, marching around a circular space and eating fruit pies. Now many schools across the country celebrate Pi Day, its date fixed by the closest and most common representation of the number Pi, 3.14, or the Friday before. Activities shared range from cutting out circles, to bringing in fruit or pizza pies or cookies, to assigning the numbers 0 through 9 a color and stringing beads or paper chains representing the colors of pi, without repeating a pattern. Teachpi.org has assembled some of the activities teachers have shared. Write numbers on index cards and have students string them, in order, down a string in the hallway. Hold a contest for the most number of digits of pi students can recite from memory. MIT posts its decisions, privately, about applicants for the next year’s class on Pi Day. Princeton combines its celebration of Pi Day with Albert Einstein’s birthday, also March 14. Pizone.org, a family-funded non-profit, posts pi-related activities and news, such as their photo of the sky on September 12, 2012, when five sky-writing planes coordinated to write 1,000 digits of pi. They include a banana measurement activity to illustrate pi. 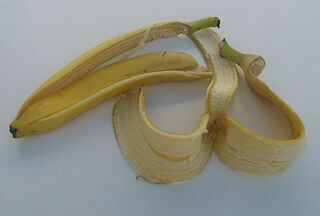 Cut off the bottom of a banana. It should be wide enough for three slices, side by side, with a little left over. That’s pi, the ratio of the diameter of the banana, represented by the slices, to the circumference, represented by the laid-open flat banana peel. Did you ever wonder what pi was, besides a formula you had to memorize? Did you know your grandchildren might now be celebrating Pi Day? What was your favorite school holiday? To you and celebrating the wonder of the world with your grandchildren. I love the scene in the movie The Life of Pi where the main character takes ownership of his name. The math teacher at my hold high school would get more than a few pies on Pi day. Students really love her…. she makes math fun. I clearly went to school too soon. Pies at school for math! Love it! I love this. I would have had a blast with this as a first grade teacher. I only recently learned of Pi day a couple years ago. Of course the people I heard about it from were both math geeks (one of them just got his PHD in math theory or some such). I always loved math because it was so clean. Not messy, like science. But, now, I like finding activities that help you visualize the underlying math principle.